A long lasting source of slow-release plant nutrients, plus microbe food and humic acids. 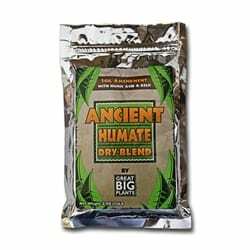 Ancient Humate Dry-Blend improves soil structure, provides a source of slow-release nutrients, micronutrients and plant growth hormones. Also boosts nutrient uptake by plant roots, feeds and builds beneficial microbe populations and encourages root growth. Ingredients: Humate chips (humic acids), feather meal, shrimp shell meal, kelp and broad spectrum trace minerals. Mix into soil as a preplant or annually at the rate of ½ cup per 5 gallons (2/3 cubic foot) of soil. Enhance results by following with Great Big Plants Natural Compost Extract. Humate chips: Humic and fulvic acids in chip form to improve soil structure, enhance micronutrient uptake and encourage root growth. Feather meal and Shrimp Shell Meal: Provides slow-release nitrogen and a food source for beneficial microbes. Kelp (Ascophyllum Nodosum): Provides plant nutrients, plant growth hormones and a food source for beneficial microbes. Azomite: Provides a broad spectrum of micronutrients and trace minerals to help plants solve the Law of the Minimum. Mix into soil before planting or till into soil annually. 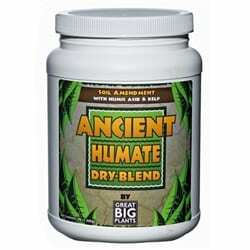 Add Ancient Humate Dry-Blend to soil at the rate of ½ cup per 5 gallons (2/3 cubic foot) of soil. Add to garden beds at the rate of 3 to 5 pounds per 1,000 square feet; turned into beds annually. For turf, apply as a broadcast 10 to 15 pounds per 1,000 square feet every two years. Enhance results by following with Great Big Plants Natural Compost Extract.